Are you having to deliver more Presentations? How are your Presentation Skills? Good, but could be better? Do you dread doing it, but can't avoid it? Do this one on one Presentation Course with professional presenter Terry Neason and learn how to plan, prepare and deliver effective Presentations with clarity and confidence. Do this 1 day Course and acquire the skills to be a flexible communicator; learn how to develop powerful personal impact and speaking skills. With this bespoke 1-2-1 training, you choose the aspects you want to work on. Rich in content and great value. 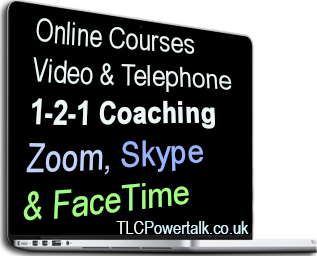 E-Coaching is for those who wish to receive one on one online coaching from the comfort of their own home, the office, or when travelling. This online course is suitable for tight budgets & personal investment. Terry Neason provides Presentation Skills Training, Public Speaking Coaching & Personal Development in Milton Keynes, London & Glasgow, UK. 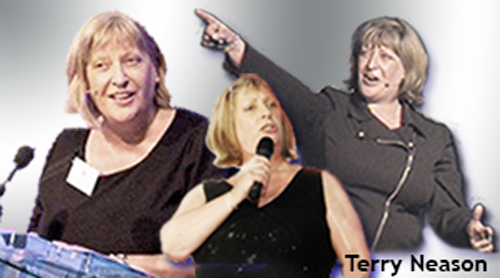 Terry is also a highly acclaimed Performer, Presenter and MC. Your venue and group of up to 8 people. Learn best Public Speaking Skills and audience techniques on this group training with professional Speaker and award winning Performer Terry Neason. Think it - Live it Personal Development Training; Take away tools, techniques and easy NLP Skills to enable and support personal growth and well-being at home and in the workplace. Themes on the day include; Confidence, Communication, Motivation and Personal Impact. "I have no hesitation in recommending Terry Neason as someone who has a clear ability to work effectively with staff and young people and help lead them to success." Walk Your Talk is an interactive motivational session delivered by award winning Performer and Personal Development Speaker, Terry Neason. Terry entertains and enlightens with powerful tips and techniques on Self Improvement, Effective Communication, NLP and Personal Impact. "The advice on language, posture, slides, breathing and delivering with emotion and conviction was spot on. As they say you've had the rest now get the best." "I learnt some fantastic techniques on communication, relaxation, vocal tone exercises and a whole lot more." "I have done presentation training before, but this took things to a totally different level – A fantastic experience! I can't recommend her more to those of you who are thinking about spending a day with her." Thank you Simon Osman, CEO, iFollowOffice and Viastak for taking the time to give this generous testimonial. "Thank you Terry, for a fantastic session...I feel very confident coming away from it and I'm really looking forward to any public speaking events I've got coming up in the future." No time to attend Courses? Need Training on the move? "Terry commanded the room at our recent industry dinner for over 300 guests in Glasgow. As our "Mistress of Ceremonies", she controlled the flow of activities and blew us all away with her fantastic singing performance. Absolutely superb." "Staff left the events feeling uplifted, inspired and filled with enthusiasm." Your Personal Brand is important. When you are on the Internet the world is watching, listening and judging. Take responsibility for how you are represented. People will Google you; the web is global advertising. Promote yourself with integrity on websites and blogs. Don't be a twit when you tweet. Communication Skills - The meaning is in the response you get. Are you satisfied with the outcome? If not, take a different approach - be flexible. Your voicemail message represents you in your absence. Promote YOU not the phone company. Impress with your own voice & script - dump the robot. Email - Be aware that CC addresses are seen and BCC are not. Know the difference and respect privacy. Never hit the 'reply to all' or you may offend strangers with annoying SPAM. Important Presentation coming up? Know it, walk it and talk it like an Expert. Preparation is the key - spend more time on you - not the visual aids. Presenting? When being introduced or featured in a brochure, supply an up to date quality Biography. Allow others to BIG you up then you won't have to. When Presenting, check out your venue/equipment well in advance. It gives more time for last minute changes, rehearsal and networking. Will you be on a platform, on the floor, standing at a podium or walking around? Be versatile - be remembered. Sound! Check if you need a mic. Find out who is on AV Audio/Visual, seek advice but still pump up the volume. Lights! Action! 55% of Communication is body language and 250,000 facial expressions. If you've got it, flaunt it. If you don't, learn it - but light it! Make sure we see it!